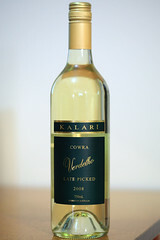 This entry was posted on Friday, 18 June, 2010 at 20:23	and is filed under Wine. You can follow any responses to this entry through the RSS 2.0 feed. You can skip to the end and leave a response. Pinging is currently not allowed. BYOB is more common than rare here in New Orleans. I’d say it applies to maybe 1/10 of the restaurants max though. The reason is probably different — there are tons of family-run “neighborhood” restauarants. They’re all also usually cash only. The wine sounds really good too, kind of an abundance of flavor.